Got a bath & blow dry. Getting him used to his grooming table. 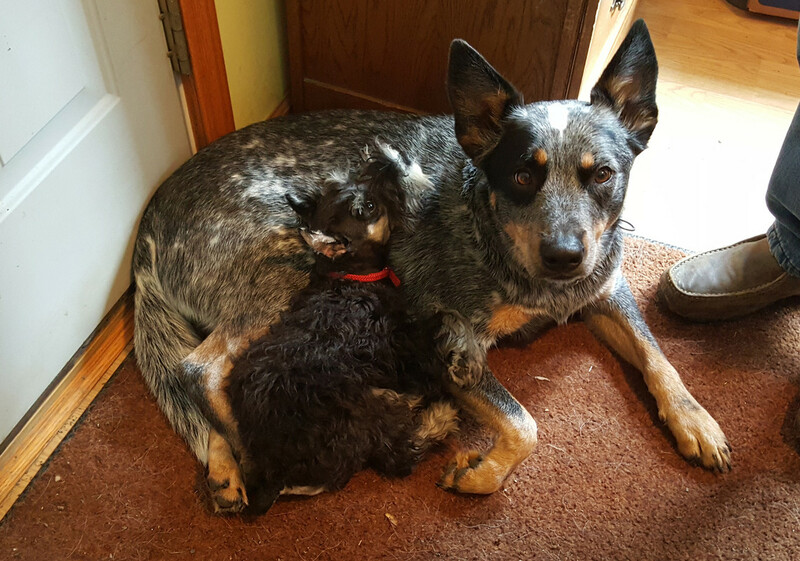 Diesel, our Blue Heeler wasn't real excited about him at first, but as you can see, they are extremely close buddies now! Grizzly just snuggles & pushes his legs apart until he fits and uses his bellie as his pillow. Yes, it is. they are getting along so well. Too cute!!! And the name is perfect! Congrats on your new furry bundle of joy. He is soooo cute, I keep forgetting I need to be firm with him at times. Yesterday, I decided to teach him to sit, so I worked on it a bit. He is sooo bubbly, he is constantly on his back feet, batting at you with his fuzzy little front feet. As of this morning, I took out a treat (piece of his puppy food), held it - and he sat right down. Good Boy!!!! Did it several times, and he sat perfect. He has a great personality and is super smart. I do demand obedience from our dogs. A bad behaved dog is no different than a bad behaved child. It is the PARENTS fault. They will get away with whatever you will tolerate. Cute puppy! He really has a neat look to him. That's a pretty nice looking heeler BTW! thanks! Diesel is 5 now. I think he is extremely handsome - but, he is structurally unsound. Has equivalent to bad ACL's. As a heeler, he extremely athletic, loves to jump for Frisbee but we have to limit his activity. Vet does not want to operate. Jeanne - Simme Valley wrote: thanks! Diesel is 5 now. I think he is extremely handsome - but, he is structurally unsound. Has equivalent to bad ACL's. As a heeler, he extremely athletic, loves to jump for Frisbee but we have to limit his activity. Vet does not want to operate. Interesting! Is it a genetic issue? The number of issues a registered dog breeder is expected to test for is astounding....almost as bad as club calves! On a side note, my blue mottle female broke a leg as a puppy (ran over by the stock trailer, dumb dog!) and that leg is still shorter than the other three. She is careful not to put herself in a position with stock that she can't get out of, but she is a sharp minded animal. She is one of the few I've bred that can work goats without nipping at all...100% mind games with this girl! I am a stickler for breed type and soundness on these dogs, but she gets a pass! I am sure it is genetic. His litter mate sibling also has problems. One of those things - researched breeders then came across a local "neighbor" with pups and loved the be nice, so purchased him. Great personality, beautiful dog - but unsound. I always castrate our dogs, so never planned any breeding. We only breed when we need a new prospect or two. We try to wait until we have about 8 people on a waiting list. Our last liter just sold out a month ago, and we already have names on the list. We have found that not many breeders guarantee their stock to work, but we do. 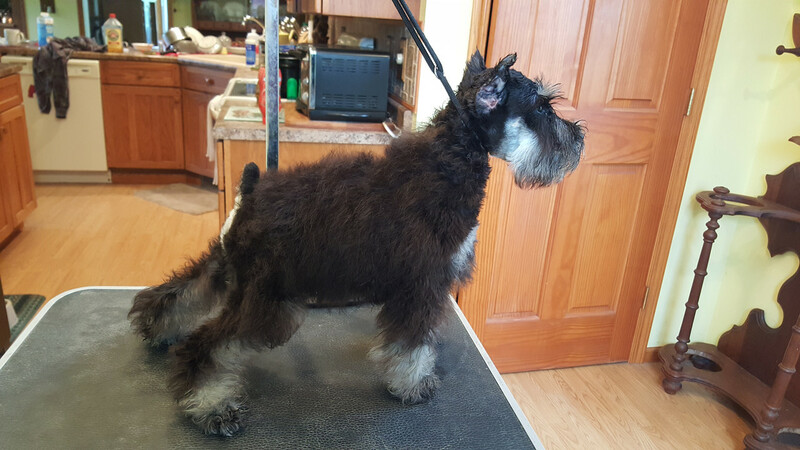 Puppies sell fast, but finding anything new for ourselves that meet that standard is tough. hopefully you don't let him sit outside and yap yap yap yap all day. ddd75 wrote: hopefully you don't let him sit outside and yap yap yap yap all day. That is a pretty dumb statement! I really don't know what you are trying to convey with that remark. To me, that is an insult to my ability to own dogs. My two dogs live with us, and are expected to behave. They go to all our fairs and people don't even know we have dogs in our display area. Expect well behaved dogs and you will GET well behaved dogs. Not sure what he meant. Maybe just humor. Just be reassured that everyone on this forum knows your compassion for animals. He has a new look. His hair was couple inches long, big fluff ball. But, it was looking dull and matted, even though there were no tangles or matts. 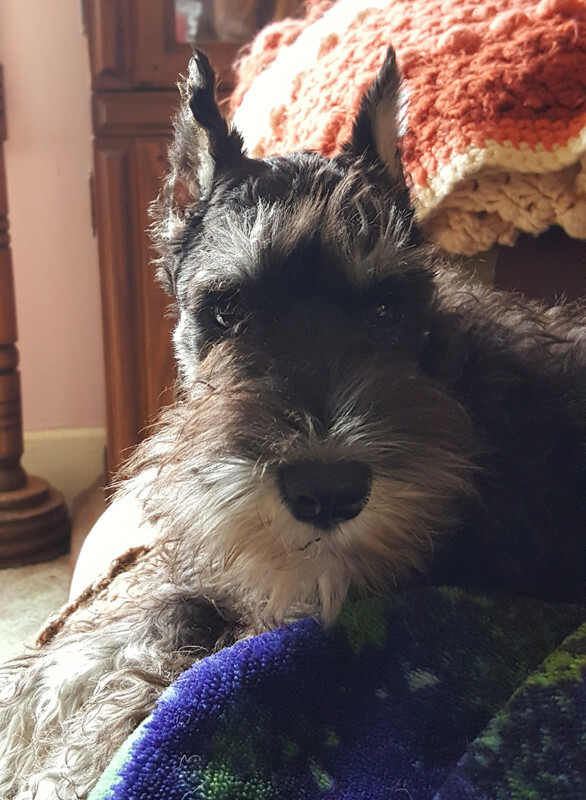 So, momma grabbed the clippers and used a blocking guard. Took off little over an inch. He looks better, but my little fluff ball is gone, boo hoo. I'm not saying anything about you. I'm talking about the dog breed. Good for you if you train them well and they aren't annoying dogs. Those dogs bark a lot. and are annoying when they do. a lot of people leave them outside and let them bark all day... Those little dogs bark echoes and travel all over.. annoying neighbors for up to a mile away.